Violations of the right to freedom of religion or belief and freedom of speech have dramatically increased over the past few years in Bangladesh. This year, four secular and humanist bloggers were hacked to death, apparently for “insulting Islam”. Niladri Chatterjee (Niloy Neel), Ananta Bijoy Das, Md Washiqur Rahman Babu and Avijit Roy were murdered on 7 August, 12 May, 30 March and 27 February 2015 respectively, by Islamist radicals. Their crime? Promoting humanism and secularism, voicing skeptical and rationalist arguments, peacefully calling for justice and freedoms in Bangladesh. On 25 November 2014, Islamists hacked to death Professor Shafiul Islam, several years after he led a push to ban students wearing full-face veils. On 31 March 2014, teenage bloggers Kazi Mahbubur Rahman Raihan and Ullash Das were sent to jail for posting Facebook comments that were considered “insulting” to Islam and the Prophet. This was after they had been attacked and beaten by a mob. On 15 February 2013, blogger, architect and activist Ahmed Rajeeb Haider was hacked to death a day after he took part in a Shahbag rally. Subrata Adhikari Shuvo, Mashiur Rahman Biplob, and Rasel Parvez were also arrested for “hurting religious sentiments” in 2013. The latest killings follow the same pattern: the victims, all people who have sought to critique Islamism, political Islam or express skepticism about religious viewpoints, were targeted and hacked to death with machetes or similar weapons. These assassinations have been claimed by Islamist group Ansarullah Bangla Team – a group that has since been banned by the Government. The banning of Ansarullah Bangla Team is neither enough to ensure physical protection of freethinker writers, nor is it sufficient to protect free speech and freedom of belief in Bangladesh. In April 2013, a rally of approximately 100,000 Islamists marched in Dhaka (video) calling for a new blasphemy law and for the execution of atheist bloggers. This demonstration was organised after freethinker bloggers started a popular movement known as the Shahbag Movement/Protest demanding justice for crimes against humanity committed during the 1971 Bangladeshi Liberation War, in which Jamaat-e-Islam and its leaders were strongly implicated. In response, hardline Islamist groups provided the government with a list of 84 “atheist bloggers” and asked for the death penalty under a new blasphemy law for those who “insult religion.” Prime Minister Sheikh Hasina said rejected the calls from Islamists to implement an anti-blasphemy law, but only because she argued that existing laws against offending religious sensibilities were already sufficient to punish anyone who attempted to insult religion. 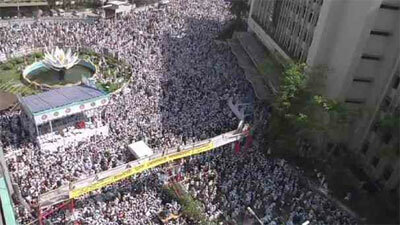 She said her government would take action against anyone defaming Islam. Soon thereafter, several bloggers were arrested, the authorities shut down their websites and blogs and pledged to investigate others on the “lists” provided by Islamist parties (for more information, see the IHEU’s story on the issue). Under the existing cyber laws in Bangladesh, a person can be jailed for up to 10 years if convicted of defaming a religion online. The existence of “blasphemy”-like legal restrictions is being used to harass and curtail the freedom of expression of the very people being targeted with violence and assassination by Islamist aggressors. Bangladesh is a signatory of the International Covenant on Civil and Political Rights (ICCPR), according to which it has a legal duty to protect the right to freedom of religion or belief (Article 18) and freedom of expression (Article 19) of its citizens. It is patently failing to do so. This issue is not only about protecting the right to freedom of belief and expression for all; it is also about helping those facing imminent threat and protecting those people brave enough to speak out against religious extremism and militancy in the country. Notably, a few days before he was assassinated, Ananta Bijoy Das was denied a visa by Sweden to speak at a conference on press freedom on the grounds that he “might not come back to Bangladesh” and that his case was “not urgent enough” (Read article from Washington Post). 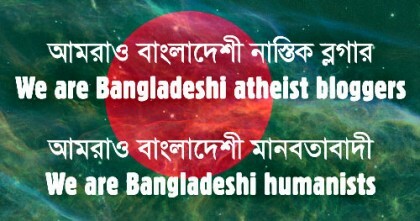 There is an urgent need to raise awareness of this issue and to call on the government of Bangladesh to guarantee the safety of its atheist bloggers, to respect the human right to freedom of expression and freedom of religion or belief, and to prosecute those who threaten, attack and harm bloggers who simply seek to exercise such a right. In 2013, when atheist bloggers got arrested by the police, the Twitter hashtag #HumanistSolidarity was also used in connection with the Bangladeshi bloggers. Act urgently to bring to justice those responsible for attacks against atheist bloggers. Do all in its power to stop the violent campaign against those who profess no religion, criticise Islamism, political Islam, or religious views. Make a clear and public statement clarifying that the right to freedom of religion or belief applies to those with no religious belief as well;. Amend legislation, specifically the Penal Code, Code of Criminal Procedure and the Information Communications Technology Act 2006, so as to bring it in to line with international human rights standards. Ensure that law enforcement agencies uphold the right to freedom of expression, and provide training to those agencies on how to deal with crimes against those seeking to exercise free expression. If a national embassy were to receive even a small number of letters on this issue, this could help encourage them to raise it as a priority with the government of Bangladesh. “Despite the adoption of the EU-Guidelines on the protection of FoRB, it still depends very much on the individual priorities of embassies and delegations whether the EU and its Member States raise the issue of freedom of religion or belief with third countries and take appropriate action”. After three murders in three months, it is clear that the EU delegation in Bangladesh, in accordance with its external guidelines, must act by increasing pressure on the government of Bangladesh to do more to protect the rights of atheist / secular bloggers in the country both through the reforming of legislation and bringing to justice those respsonsible for commiting atrocities against the bloggers in the first place . Remind decision-makers of the facts (see our briefing Briefing focus Bangladesh). Underline the fact that the right to freedom of religion or belief includes the freedom not to believe and to change one’s belief. This is a right recognised by international law; notably the ICCPR of which Bangladesh is a signatory. Insist that criticising religion as such, or holding to account specific religious authorities in particular, is not automatically hateful and should be protected; this is essential to maintaining a secular state and respecting international human rights standards. Recognize that Bangladesh’s Government has banned the islamist group which claimed responsibility for the murders of Ananta Bijoy, Md Washiqur Rahman Babu and Avijit Roy but that this is far from sufficient to ensure the security and protection of writers and bloggers who are on the “hit-list”. 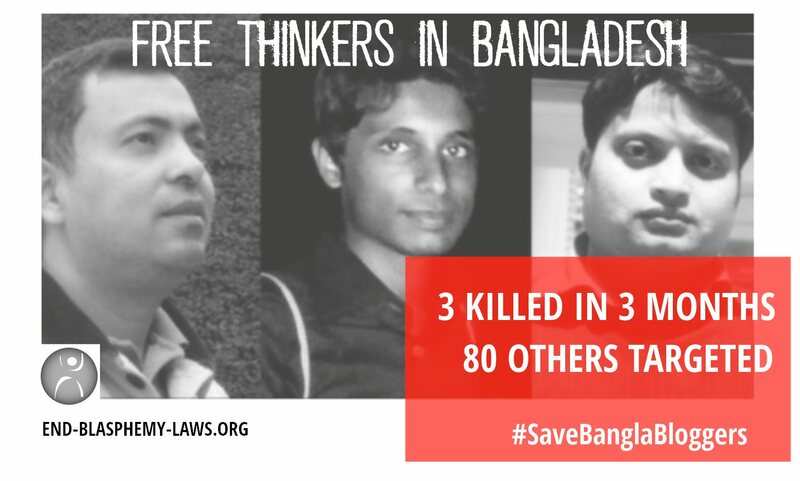 Request that EU Institutions: strongly condemn these murders; call for the removal of any provision condemning “insult to religion” in Bangladesh’s legislation (more details here); and take concrete actions to protect the safety of freethinkers, including via the facilitation of visas and asylum status. For the full country report from the End Blasphemy Laws campaign, see our Bangladesh page. For further issues around human rights and the non-religious in Bangladesh see the Freedom of Thought Report country entry on Bangladesh. or wider issues on freedom of religion or belief in Bangladesh see: US Commission on International Religious Freedom 2015 report (p 193- 194).